Robert Pera had the dream of making money fast and early in life, he left his job at the mega-tech company, Apple, to establish Ubiquiti network a communication technology company involved in making wireless products capable of providing internet access to people via a Wi-Fi amplification system. In 2011, six years after he founded his company, Robert became a billionaire after the launch of Ubiquiti’s IPO. In 2012 he also became the owner of NBA side Memphis Grizzlies when he purchased 25% of its stakes. Evan Spiegel isn’t just the youngest billionaire on this list but also the youngest billionaire in the world. During his college years at Stanford University, Evan, together with two others in 2011 co-founded the mobile SnapChat app, an application that enables its users to record videos, take photos, add text and drawings and also share with contacts. The application with over 100 million clientele consists majorly of the youths. Jack has got two giant-tech companies to his name. He is the co-founder of popular social media app “Twitter” where he controls 3.5% of its stakes and also the founder of $6 billion company “Square”. Square makes hardware and software products that enable debit and credit payments to be carried out via smartphones. Before completely drifting into the tech world, the 1999 college drop out had a stint as a fashion designer and also worked as a licensed masseur. In 2008 Zhou Yahui founded Kunlun Tech, an online game distributor, and developer in China. The company realized $229 million when it went public in early 2015 making Zhou Yahui a billionaire. Mr. Zhou Yahui who is also the chairman and president of the company holds a master’s degree from Tsinghua University, Beijing. Amazingly, this billionaire’s highest level of formal education is a diploma. Unlike his counterparts who attended and dropped out of college, Sean never knew what it was like to attend a university; however, the knowledge of programming he learned from his dad paid off sooner rather than later. In 1999 at age 19 he co-founded an online file sharing service- Napster and began making more than average income from various projects. At 24, he became the founding president of Facebook and made a fortune of $2 billion via Facebook’s IPO. Brian Chesky is the CEO and one of the trio co-founders of Airbnb “Air Bed and Breakfast” a website that helps travelers find and rent lodging in rooms or apartments available in privately owned residence. The foundation of the company began when Brian and his then-roommate and now co-founder Joe Gebbia devised a means of making money by renting out their rooms to the guest of an industrial design conference in San Francisco who were desperately in need of an accommodation as most hotels in the town were fully booked. Since its inception in 2008, the website now boasts over 1.5 million listings of rooms and apartments in 34,000 cities and 190 countries and has serviced over 30 million guests. Brian owns 13% stakes in Airbnb Inc.
Gebbia is the co-founder, designer and chief product officer of Airbnb. While studying at the Rhode Island School of designed where he obtained a Bachelor of Fine arts degree in industrial and graphic design, he met course-mate Brian Chesky, and together they gave birth to the idea of Airbnb in 2008. Gebbia aided the growth of the company into business travel in 2015 and also the development of new markets in Africa and Cuba. He is entitled to 13% stakes in Airbnb Inc.
Nathan is the third co-founder and chief technology officer of Airbnb Inc. The Harvard alumnus recently guided the company to establish its services in Cuba where it currently prides above 2000 listings. According to Forbes speculations, Nathan owns 13% stake in the $25 billion valued private company. Frank Wang is the founder and CEO of China-based Da-Jiang Innovations Science and Technology Co (DJI) a drone manufacturing company. Drones also called unnamed aerial devices (UAV) were initially used for military purpose but in 2006 Frank invented specialized versions for commercial and recreational uses. Among all of DJI’s products, the Phantom is the most lucrative. Phantom is a remote-controlled winged camera, capable of capturing images and recording HD videos from incredible heights. Frank started DJI with a borrowed $250k and today, the company is the world’s largest drone manufacturer with a valuation of $10 billion. Eduardo is one of the Harvard undergraduates who came up with the idea of Facebook. As the co-founder of Facebook, the majority of his wealth comes from his ample shares in the social media company. Apart from Facebook, the Brazilian is the co-founder and chairman of LA-based private equity firm Velos Partners. The Singapore-based entrepreneur is a major investor in numerous technology startups including Jumio, Qwiki, an online news site “Tech in Asia”, airport car rental service “Silvercar”, and India online Kids-wear retailer “Hopscotch”. As a post-grad student Gareth in 2002 founded StumbleUpon, a web-discovery tool and in 2007 sold it to eBay for $75 million. In 2009, the Canadian co-founded Uber, an online car-hire service. Uber’s services which dominate in major US cities has its operations active in 58 countries. The company is currently valued at $50 billion. For Travis, the journey to becoming a billionaire wasn’t quite night follows day. Before making it big as CEO and co-founder of Uber technologies, Travis founded online file-sharing service but it failed after being sued by two top American media associations, again in 2001, he founded online peer-peer file sharing service Red Swoosh which he sold to Akamai Tech in 2007 for $18.7 million. 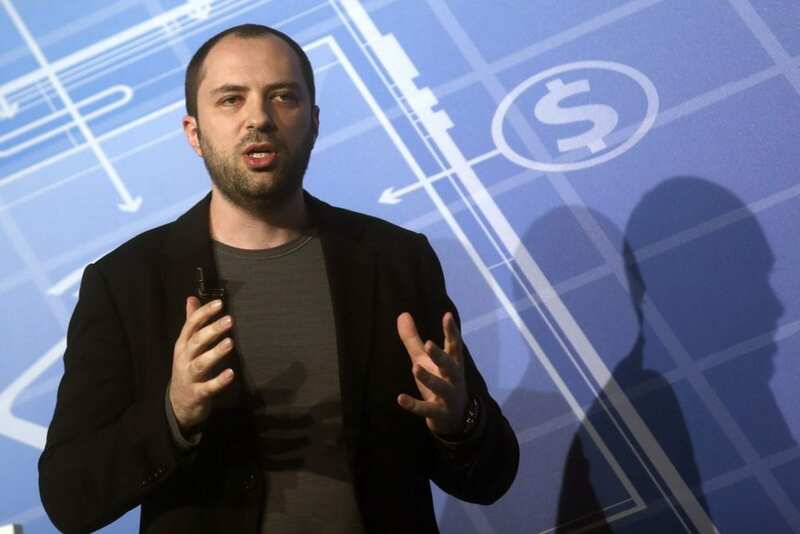 The Ukrainian born enternetpreneur co-founded WhatsApp, which is currently the world’s largest instant messaging app for smartphones with over 800 million worldwide users. After selling WhatsApp Inc in February 2014, to Facebook Inc for $19 billion, he became one of the managing directors of Facebook Inc. WhatsApp co-founder Brian Acton who is worth $3.7 billion would’ve been on this list if he didn’t exceed by 3 years the age limit. Dustin is the second wealthiest of the five Harvard dorm roommates who co-founded Facebook. In 2008, he left Facebook to build Asana a software firm but still kept his 5% stake in Facebook. Dustin also sits on the BOD of artificial intelligence company Vicarious FPC Inc and runs Good Ventures, a philanthropic foundation with his wife. In 2012 Forbes announced him the richest self-made billionaire in history. Everyone knows the story of the Harvard dorm roommates that brought about the invention of Facebook in 2004, well except you’ve been hiding under a rock. At 23, Facebook already made Mark a billionaire. He is the chairman, CEO and richest of all 5 co-founders of the most popular social media on earth. With about 1.49 billion monthly users, Facebook employs a total of 11,000 people worldwide.